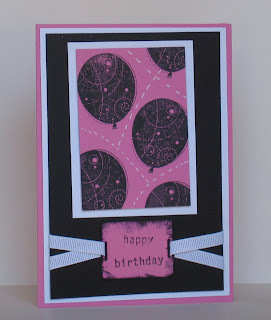 Helen's Stamping Page: Way out of the box! Ok here goes...what do you think? I am not sure if I like it or hate it but thought I needed to try something new. The colours used are basic black, regal rose and whisper white. The stamps set it from Sale-A-Bration "Birthday Whimsy" such a cute stamp set I can see i will get so much use out of it. Sorry i haven't been around for a few days as I have had my husband home sick. He's ok just flue..feeling much better today and back at work.